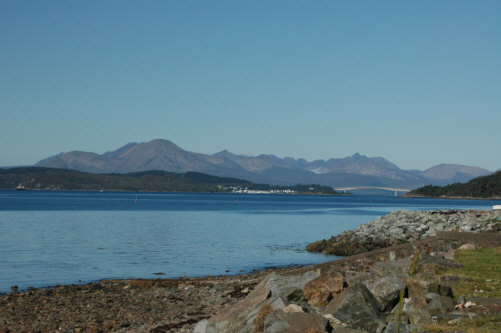 This is a picture of the Skye Road Bridge with the Cuillin Mountain range in the background. The Cuillins are famous for their rugged splendour which provide a stiff test even for experienced "mountain men". The names of the individual mountain peaks tell their own stories. With names such as Am Bastier: "the executioner"; Sgurr a Ghreadaich: "the peak of torment" and An Garbh-choire: "the wild cauldron".